We have locations of activity in Jamaica, the Caribbean and throughout The UK such as the home counties and the south west. Our management team all emanate from the deprived or disabled community and have had to overcome the rigours and demands of those experiences and with the knowledge of our experiences relating to the onset of illness or injury we will succeed in making our organisation successful and sustainable as well as managing the rapid growth of the only disabled organization operating both in The UK and The Caribbean. The main objectives of the Caribbean Disabled Sports Association CIC (CDSA) is to promote the benefits of healthy activity whilst increasing social interaction and self esteem for the disadvantaged and disabled participants both in the UK and Caribbean. The CDSA will also aim to overcome the problems prevalent in sport by virtue of accessibility and cost especially for those with mobility problems and dependent on a fixed or limited income. CDSA will also seek to promote employment and volunteering prospects by introducing appropriate apprenticeships and training opportunities. CDSA will also be involved in the innovation, design and development of bespoke equipment which will enable those with physical disabilities to enjoy a more active and healthy lifestyle. 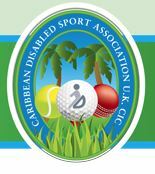 The Caribbean Disabled Sports Association CIC is the only pan disability sports organisation which is based both n the UK as well as The Caribbean and promotes more than just sport or activity. CDSA offers free membership which means that those on the lowest income will become part of a community which will help support them to become more active and trained for greater involvement, not only in their own community but also in our various activities. CDSA will also offer a wide range of advice and information for our members, from locating accessible activity sites, help with acquiring equipment, choosing appropriate coaching, all the way to advice on benefits and training. The Caribbean Disabled Sports Association is involved in the world of sport with the emphasis on the accessibility, inclusion and participation which until recently was unheard of. This is despite the fact that sporting activity is played by a wide age and skills range group. We have many years experience in attracted many thousands of participants as well many 100s of volunteers. We have supplied many thousands of hours of professional “one to one” coaching and raised over the profile of sport and disabled people’s participation. We are a not for profit organisation so that all of the money raised will be re-invested in our activities. We have arranged events for newcomers to sport, experienced players all the way to International competitions. We will build and develop our own web sites which we expect to attract between 20 – 30,000 hits per month. We will launch our own range of clothing and help to develop equipment specifically designed for those with physical disabilities. We are currently represented on many national disability groups thus we are able to learn from others and pass on the good practice which we have instigated. We are now reacting to many requests from our members and associates to create apprenticeship training so that those with the skills, enthusiasm and acumen can be taught to coach others. This will allow us to train the increasing numbers of untrained disadvantaged and disabled players who are attracted to sport on a regular basis. As a Disabled Person User Led organisation (DPULO) we are a disabled group who understand the needs of our disabled and disadvantaged members.